Community currencies achieving social, environmental and economic impact. Written with my NEF colleague Susan Steed. Download full PDF here. Since the financial crisis, interest in new types of money has surged. Projects like Bitcoin have hit the headlines as communities around the world experiment with their own currencies and methods of exchange. In this new and innovative field, we have only just begun to understand and measure their impact. This report uses the results from these CCIA pilot schemes, as well as other successful international examples, to assess the effectiveness of community currencies against the social, economic and environmental outcomes they were set up to achieve. Community currencies vary widely in the way they are set up and run. They may be designed as printed vouchers or as digital credit. They can be focused on a specific group of users, such as patients in a GP’s surgery, or instead be open to stimulating economic activity across an entire town or region. These individual design features and objectives are important, but this report moves beyond describing how a currency is set up to focus on what the projects are achieving. We assessed the six CCIA pilot projects under four outcome themes: Democratising services and organisations; Supporting the small and medium-sized enterprise (SME) economy; Countering inequality and social exclusion; and Addressing environmental impacts. Time credit currencies in Amsterdam (the Makkie) and the United Kingdom (Spice Time Credits) have helped to rebuild social capital and people’s confidence in their own capabilities. Business currencies in Amsterdam (TradeQoin) and Nantes (SoNantes) are starting to provide interest-free credit and alternative networking platforms outside of the corporate world. Between these two models, local currencies like the Brixton Pound offer an easy interface for businesses and local authorities to bring identity and place back into everyday connections. E-portemonnee in the East Belgian province of Limburg is building a currency system that supports the environment and makes it easy for people to make sustainable choices. Each of these pilot projects holds important lessons for future currency innovation. While good technical design is essential, this evaluation shows that the most successful schemes are those which have fully integrated a currency into existing communities or economies, often designed in partnership with their potential users – be they individuals or organisations. Further evaluation for many of the projects referenced in this report is needed. Only then can their huge potential be translated into robust, accessible guidance and knowledge to advance the wider community currency movement. 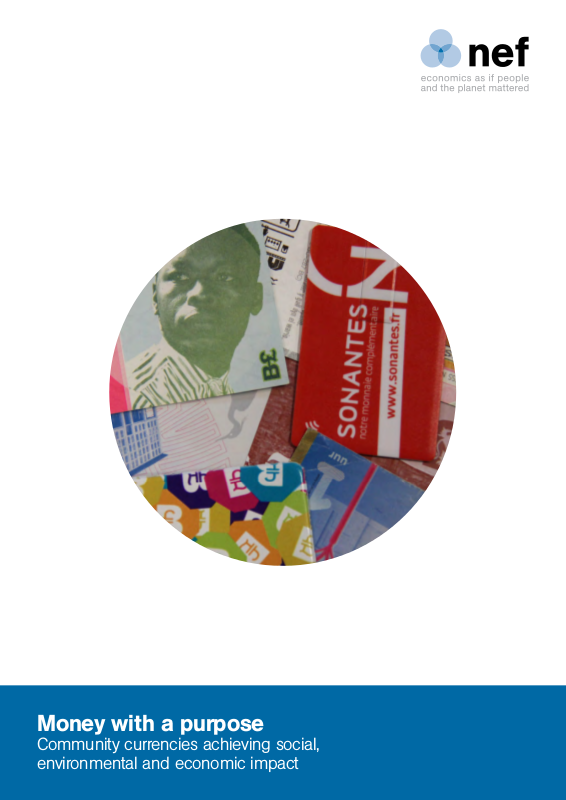 SoNantes – a currency run by Crédit Municipal de Nantes, a public financial institution in France. This currency incorporates both a mutual credit system and a local currency. Makkie – a timebanking currency in Amsterdam East in the Netherlands with local citizens earning Makkies by volunteering in community projects and spending them on a range of goods, products, and services. TradeQoin – a business-to-business trading network run on mutual credit and set up cooperatively with businesses in Amsterdam. Spice – a social enterprise originating in Wales that is based on time as a currency and helps organisations to use their time credit currency. The Brixton Pound – a local currency in Brixton, South London, set up to support independent businesses and working with Lambeth Council. E-portemonnee – a digital e-wallet which gives credits for environmentally friendly behaviour and is run by a publically owned waste disposal company. In addition to the report, the appendix contains sources that can be used to measure the outcomes of your own currency project. Download the appendix here or by clicking the link below. This summary first appeared on the NEF website on May 18th 2015.